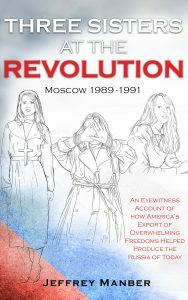 – An Eyewitness Account of how America’s Export of Overwhelming Freedoms Helped Produce the Russia of Today. Imagine a world of too much freedom. Imagine having too many choices. Imagine foreign languages flooding the television. Imagine gangsters being the only ones making good money. Imagine your parents losing all of their life savings in a matter of weeks. Imagine your children enamored with another country and dreaming of leaving. Imagine your nation imploding from being a world leader to a supplicant for aid in a matter of a few short years. Because of an invitation to witness the last rocket launch of the 1980s to the Russian space station Mir, I saw this unholy world. I became both an eyewitness and a participant in the desperate efforts by good people to live and thrive and understand their own world as their country collapsed. Three Sisters is the true story of what I saw. The manuscript was finished by 1994. I’ve changed none of the opinions and occurrences from that time. I will add that the book was written far before the attacks of 9/11 when America became painfully aware of just how disliked we are in many parts of the world. Yet, even in the early 1990s there were the signs of the troubles soon to come. For those of us on the American frontiers, in places like the Soviet Union, it was clear some of the world felt threatened by us. Not our music. Not our fashion. But from our relentless drive to install our values onto other societies. While so many Eastern European countries embraced much about the American way of life, other parts of the Soviet Union felt differently. One can see in the pushback from my very special friend Olga, who introduced me to her life in Moscow. And with another of the three sisters, Little Irina, who ended up doing business for the Russian Church. And in the comments from the future oligarch Boris Anatolievich. From just about all of the friends in Olga’s circle there were the first signs in the early 1990s of the nationalism that has overtaken Russia today. It is my hope you can come to understand, as I did, just how wrong were the ambassadors of American religions like Billy, the Florida evangelist, who sought to change the very soul of the Russian people at their weakest moment. That Billy was in way over his head only made him more a target for those defending the Russian Orthodox Church from foreign invaders. What I saw in Moscow at the collapse of the Soviet Union, and how much the three sisters changed me, is the focus of this memoir.